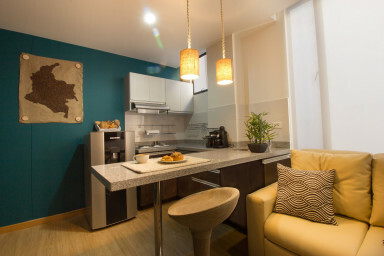 Unique apartment located in Chapinero, a culturally diverse hot spot in Bogota! This unique home will allow you to experience the rich culture, smells and flavors of Colombia, combined perfectly with all the necessities for a comfortable stay in Bogotá. This hand crafted apartment utilizes local artisans for its furnishings. With a bean grinder and coffee & espresso machines, there is no better place to discover the best coffee in the world. This is a self-serviced apartment which will fit 3 guests comfortably. Guests will have access to everything seen in the pictures! Building features: communal laundry, BBQ area, 2 communal terraces, elevator, advanced security system. The Sofa converts into a bed for additional guests. Note: Some of the decoration seen in the photos are not at the apartment. Bogota is a big city and late check-ins cost us time and money to get there. There will be a small check-in fee (10 usd) after 8 pm (20:00) and on weekends or public holidays. The apartastudio is located in Chapinero (Carrera 57 # 14 – 23, Edificio K57), one of the most central and exciting neighborhoods in Bogotá. It is a culturally diverse hot spot, full of nightlife, commerce, and universities, a definite favorite among visitors to Bogotá. Easy access to the North Zona Rosa and centro/Candelaria parts of Bogota. 15 minutes walking distance from Zona G – the best gourmet zone of Bogotá.